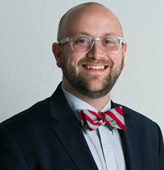 Nic Hartmann is a public folklorist and educator who serves as the Director of Learning & Civic Engagement at the National Czech & Slovak Museum & Library in Cedar Rapids, Iowa. He is responsible for creating and facilitating learning opportunities based around Czech and Slovak history and culture. He holds a PhD in Folklore from Memorial University of Newfoundland, and in 2015, earned the Archie Green Fellowship from the American Folklife Center at the Library of Congress. Married with two daughters, Nic is also passionate about dance, sacred art, and Scouting.